This yummy treat is my copycat version of an oh-so-cute and incredibly delicious dessert our girls enjoyed at Chip 'n' Dale's Harvest Feast Dinner, a character meal in EPCOT. It's so simple to put together, yet induces involuntary "WOW"s! 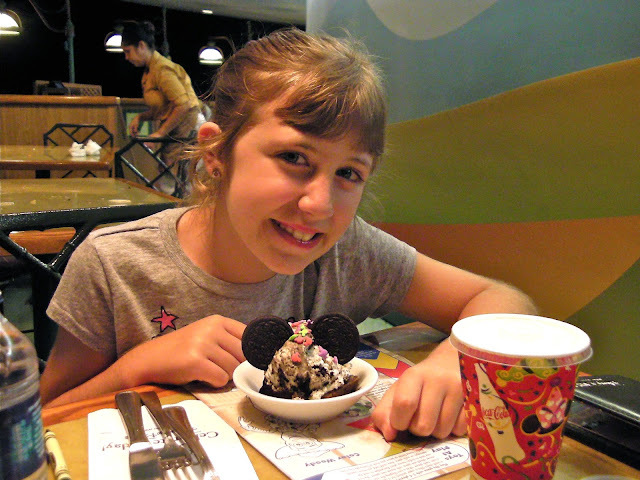 Excited to share this fun dessert with you in anticipation of what I'm preparing for next Magical Monday, a post dedicated to helping you choose the best character meal for your family's next trip to Walt Disney World. We've enjoyed many character meals offered on WDW property. I'm looking forward to sharing my family's lists of MUST TRY eats, pros and cons, and plenty of magical details and photos that'll have you wanting to make your advanced dining reservations ASAP! 1. Bake your favorite brownies. Cool. Cut. 2. Place a brownie on your cutest plate. 3. 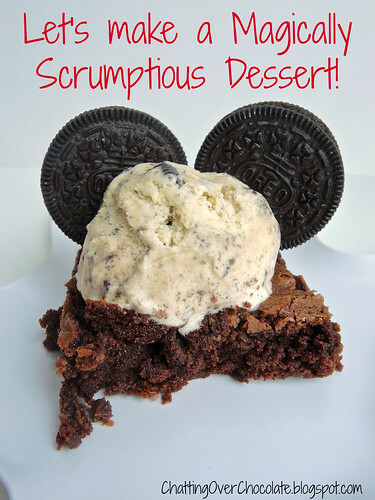 Add a scoop of Cookies & Cream Ice Cream on top of brownie. 4. 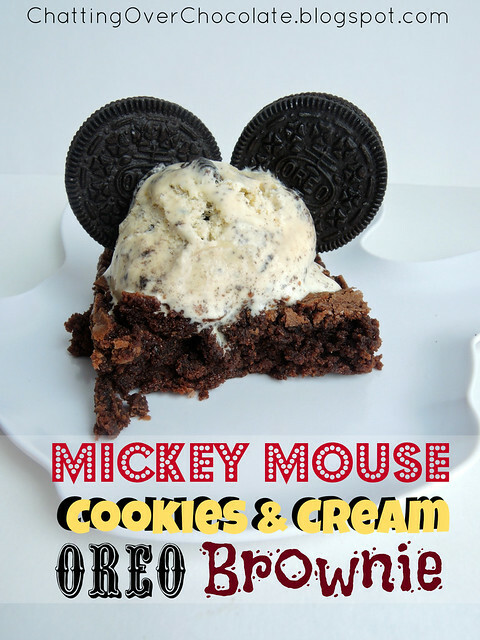 Press two Oreos in Ice Cream to create irresistible Mickey Mouse ears! Hope to see you next Magical Monday! These are so adorable! What an easy way to make dessert even more special! Thanks so much for sharing! Hope you have a wonderful Easter! Oh my! I wish I could reach inside my computer and gobble this up! :) I love brownies and ice cream! Perfect combo and adorable too! I would eat this up! Oh my cuteness, what a great idea!!! awesome, love how simple too! This is super cute! :) The fonts you picked are perfect for each word too! That looks wonderful! Of course I am a sucker for both the oreos and the brownies! LOL! Oh my goodness- I love these! My kids would get a kick out of them. Thanks for sharing!! Hi! Followed you over from Dysfunction Junction blog hop. This is too cute! I can't wait for my daughter to be old enough to do cute things like this. Now following via GFC. How cute! Looks yummy, too! I have so many friends that are obsessed with Disney, this would be so fun to make for a celebration! Thanks for sharing at Domestic Superhero Sharing Thursdays! A precious dessert for the little ones and the bigger ones as well. Thank you so much for sharing this awesome recipe with Full Plate Thursday and have a great weekend! This is so cute! I just had my daughter's 2nd Birthday, and it was Mickey and Minnie Mouse themed. Wish I knew about this earlier, and I would have tried it out for her party. But now that I know about it, I'll definitely try it out soon with her. These are so cute! What a fun way to eat brownies! Thanks for sharing! What a cute and yummy dessert! This is so cute and absolutely delicious looking, Brenda! I love all your Disney creations....you must be a fun mama :) Hope you are having a great weekend!! That is so adorable! Thanks for partying with us at Time To Sparkle! Such a cute idea! I should do this for my little ones. 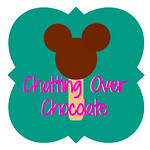 We went to Disney World in September and it would be a fun treat to have while chatting about our memories from the trip! Thanks so much for sharing at the Back for Seconds Social! I can't wait to see what you share next! Totally pinning and making this for the weeks leading up to our WDW trip. Thanks for sharing at Pinworthy Projects! By the way, we need to talk :). I'd LOVE for you to share something Disney-ish for when I'm on my trip. You'd be perfect for guest posting!! !